It’s time to get the no Grinderman blues. 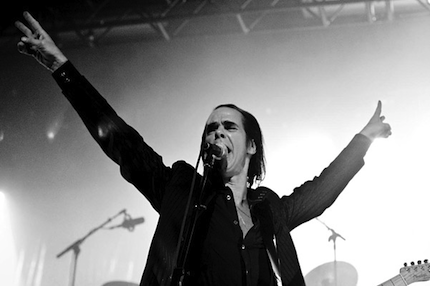 Nick Cave has called an end to his Bad Seeds band’s unwholesome gutter-rock seedling, the NME reports. Cave made the announcement at the end of Grinderman’s set over the weekend at Australia’s Meredith Music Festival. “That’s it for Grinderman,” Cave is quoted as saying. “It’s over.” Then Grinderman quietly departed the stage, leaving the 12,000 audience members to determine whether or not he might be kidding, according to the NME’s account. Cave formed Grinderman in 2006 with veteran Bad Seeds members Warren Ellis (violin), Martyn Casey (bass), and Jim Sclavunous (drums). The group released a pair of glowingly reviewed albums, 2007’s Grinderman and 2010’s Grinderman 2. With a visceral, misanthropic squall, Grinderman gave the former frontman for late, lamented Aussie racket-makers the Birthday Party a harder-rocking counterpart to his Bad Seeds work: These dudes were bringing horny back.